Notes: Based on the 'Answer' arcs of the doujinshi soft sound novel series Higurashi no Naku Koro ni, created by 07th Expansion. 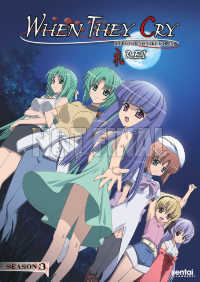 The second season of Higurashi continues the story of Hinamizawa village as the mystery that lies at the village's heart begins to unravel. The greatest problem found within the borders of any mystery conceived is that within those boundaries there must be an answer, a solution to that mystery. In this sense, the first season of Higurashi had it easy. It strung us along, sliding us down the merry chute of deceit greased with the blood of torn up moe archetypes - shooting us out the other end so fast that there was a good chance you could have missed the clues to what was building up just beyond the ending credits. Obfuscation was Higurashi's greatest strength, like Rashomon or The Usual Suspects; it is a show that gets you asking the wrong questions so you end up missing the obvious right answers. The second season (henceforth referred to as Kai) by necessity, however, could not do the same. It would have to tell the truth when it came down to all and that is a quite the challenge for a show so good at lying. How would it hold up? Let me be blunt, if you're looking for more of what Higurashi was then you are going to be disappointed. If you enjoyed the original for the laterally arranged narrative and deceptively constructed plot then Kai will seem simple and linear. If you enjoyed the gratuitous violence that the first season served up then Kai will seem incredibly tame. If you enjoyed the melancholic and oppressive atmosphere of the first then Kai will once again leave you wanting. Everything that characterised those twenty-six surprising and bloody episodes has vanished away in the face of what Kai decides to be, which is nothing like its predecessor. So what is it then, if not bloody, bleak and confusing? Isn't that what Higurashi is? Kai initially seems disappointingly simple. Where the line of protagonist and antagonist was obscure, it is now clear. The truth of the situation in Hinamizawa shines out almost without any aplomb whatsoever, no big reveals just piles of carefully portioned truths spread out over episodes - starting exactly where the first season left off with Rika and the repeating summer of 1983. I thought that was interesting though. Without spoilers from me, the truth of who is responsible for the Hinamizawa disaster jumps out mid conversation with no special foreshadowing or even much discussion afterwards - the show reveals things as naturally as it hid them. Yes, things are different with Kai but are they worse? My answer is no. Kai is a triumph in that it takes many of the things that made the original enjoyable and abandons them but goes on to find new ways to be equally enjoyable. For example, Kai seems gloriously happy in its newly acquired linear form. Pacing is not an issue and to call it riveting would not be an understatement, roaring along as if it had just been waiting to break free of its complex restraints this whole time. The characters remain and the individuality and sympathies that the first season built up remain strong even without the focus they received in the first season. Even when the antagonist is revealed they are not taken for granted and receive characterisation and a back story that make them perhaps one of the most sympathetic and interesting villains that anime has to offer - too evil to support but I found myself not wanting anyone to lose either. Funnily enough, the problems with Kai are a few of the only things that actually carried over from the first season to any great degree. The animation has improved but it's as if they've fixed a go-kart for the Monaco Grand Prix, it's still woefully lacking. The scripting can be dire too, the dialogue flowing like a palette of bricks tumbling from a scaffold. The show feels compelled to explain everything that has shown clearly on screen already as if we weren't actually watching the show or are just stupid. The comedy sections are still bitterly woeful and there is the added plague of them popping up randomly between tense and dramatic scenes for the benefit of no one, jarring what is often an effective atmosphere. Overall, Kai is a very good show. Even if the techniques change, the skills and talents that went into making the first season a worthwhile show are put to good use in different ways and go to show that different doesn't necessarily mean bad. Kai goes such a long way with its great, fleshed out cast, excellent and well-executed concept and well-paced drama that I find it incredibly easy to ignore its shortcomings and focus on what there is to enjoy. Fans of the original are bound to be surprised but look beyond that and love the answers as much as the questions.